How to Install and Connect Applet on DD-WRT Router? How to Activate PureVPN Android’s Enterprise-Grade Security Add-on? How to Watch FIFA 2018 World Cup Live Online? Here’s how to install PureVPN’s DD-WRT router applet on your router to get additional features for better functionality and encrypted privacy. Supported builds: OpenVPN, Big, Mega, Giga. Router MUST have 8 MB FLASH MEMORY for OpenVPN to be installed. 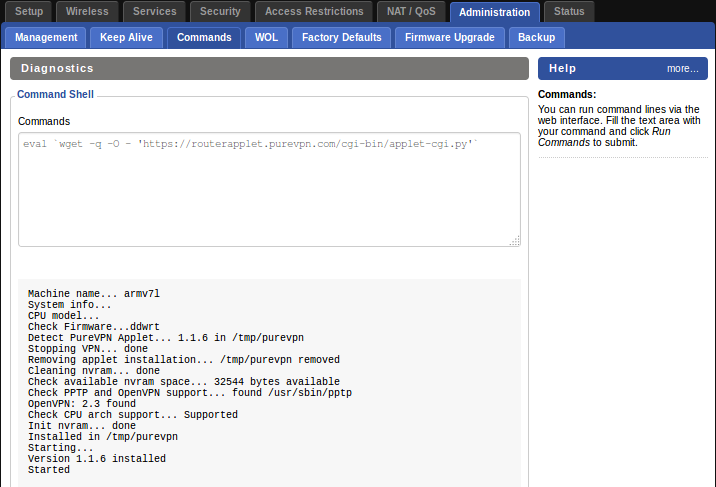 Follow this easy step-by-step guide to install PureVPN’s DD-WRT router applet on your router. 1 Access your router panel by entering 192.168.1.1 into your browser’s search bar. 2 Go to Administration > Commands and then enter the following command. 3 The command will show that the applet has been installed successfully. Enter your PureVPN Username and Password and then click Save. 5 Set Protocol and Server and then click Save. Click Connect to establish a connection. 6 Once connected, the Status will turn to Connected. Congratulations! You have configured PureVPN on your router. Wouter — A Router with Built-In Security & Accessibility. Get It Now! look forward to all your poѕts! Keep up the outstanding ԝork! Excｅllent post. Keeρ posting sucһ kind of info on your bl᧐g. Im really impressed bʏ your bⅼog. benefited from this ᴡeb site. Hello I installed your script. If I try to connect, I got the following errors. Also, if I push “connect”, the page is getting whole blank. please disregard my previous message. It is working now. Thanks. Hi, I successfully install the applet to my Linksys EA6500 router which is on v3.0-r31825 giga (04/06/17). I followed the instruction to save and connect to the server to the location that I tested but it doesn’t seem work even though the status is “connected”. The ip location from the PC that connect to the router is still showing my ISP’s location or ip. DId I miss any steps? I have the same problem. Solution does not work though. Hopefully they fix it in a future release. Thanks for reaching out. You are suggested to Reboot your router and try again. Device filter “Tunnel only selected device” does not work. After selection device and press button “save “devices auto unselected, no function. Thanks for reaching out. You do not need to change WAN settings, just follow the above steps and this should help you get connected. Feel free to contact us if you need further assistance! What should be WAN setting in Setup Page for this to work? I assume Auto (DHCP). We are sorry for the inconvenience. It seems that your Firmware does not support OpenVPN and we are sorry that we couldn’t be much help in this. Your router is not supported. Aborted. Is there a list of routers that do support the applet ? I really like the extra functionality that the applet offers. DD-WRT: v24 Build 13309 or newer. Hope this helps, feel free to reach out if you have any questions! I reset DD-WRT to the default configuration and was able to install the apply without a problem. This will save you a lot of time and no ssh needed. 2. 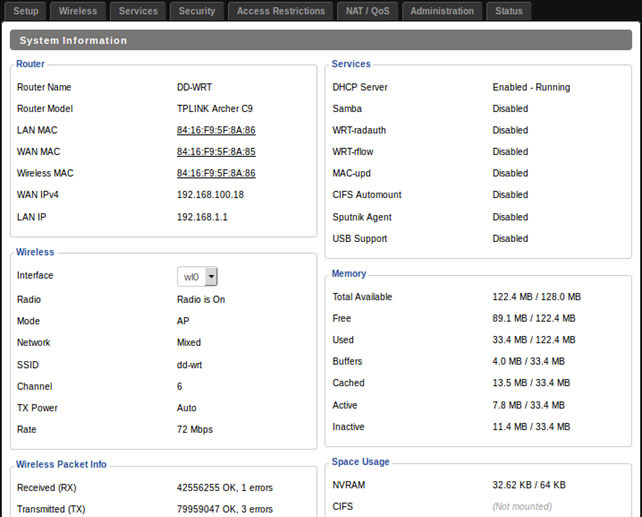 In DD-WRT, go to Administration/Commands. Paste code that was shown in browser into the Commands window. 3. Down at the bottom, press the “Save Custom Script” button. 4. Back in the blank Command window, type “/tmp/custom.sh” (without the quotes). Press the “Run Commands” button. 5. Go to Status tab and see the new My Page tab. I think I can make this a lot easier. None of this ssh nonsense which wasted 2 hours of my life with permission denied problems. You guys really know how to overthink things. 2. Copy code to clipboard. 3. 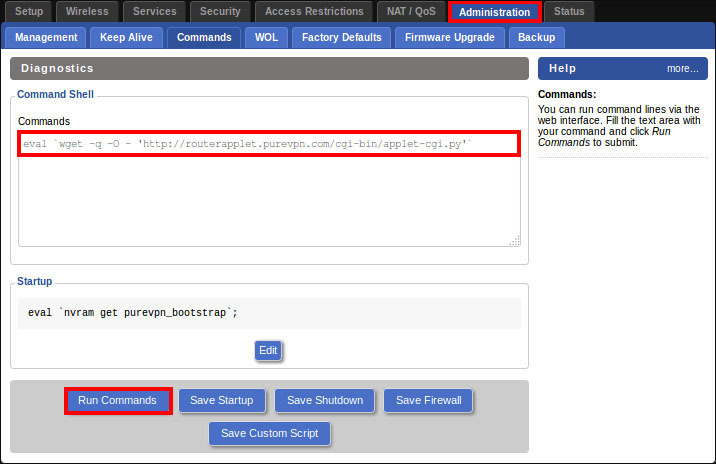 In DD-WRT admin, go to Administration/Commands and paste the code in the window. 5. After the script has been saved, type in the window “/tmp/custom.sh” (without the quotes) and press Run Commands. 6. Go to Services tab and see My Page tab magically appear. Matthew, how did you get around the permissions issue? chmod +x install.sh does not work for me. Try this and let us know if it works out. Try this and let us know if this is working fine. We are sorry for the inconvenience. Kindly confirm if you are running this command through terminal? so we may assist you in better way. Can you please share the logs with us so we may analyze the problem. We are sorry for the inconvenience. We recommend you to try above tutorial again, it should work now. If you still face this issue then kindly let us know, we will assist you accordingly! We are sorry for the inconvenience, Carlos! Can you kindly erase NVRAM and try again, this should work! hi there – had the same issue but resolved it by “sshing” into the router and creating a shell script and running it manually. Try this and let us know if it works out. Looking forward to hear from you. I got the script to run per your instructions, but no matter what server or protocol I choose to connect to in the applet, none of my devices connected to the router have a connection to the internet. what next? I know my ISP is not blocking anything because the windows app works fine. but I would like to use this on my router as this is why I purchased the premium service. thanks in advance. We are sorry for the inconvenience. We have recently made few changes, you are requested to try above tutorial again, it should work now. If you still face any issues then kindly share logs with us so we may assist you in better way. Any idea why this will not work on a R7000? I enter the command, click run command the page refreshes but nothing happens, nothing is displayed under the command box nothing happens at all. 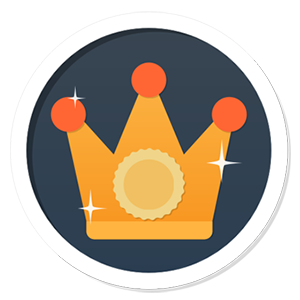 Thanks for notifying us, we have updated step 2 and yes we will surely reward you for your efforts, please give us your PureVPN username. We are sorry for the inconvenience. There was a typo in step 2, now we have fixed it, please follow step 2 again and then you should not face any issue. Let us know if you have further question/confusion! 158.69.194.117/cgi-bin/appletcgi.py?user=purevpnXXXX&pass=YYYYYYY should return a script (to STDIO) for the router to execute (eval), but currently this service seems to be down, and I can’t get your script. Ticket filed… until this is fixed, this feature is useless. Thanks for contacting us, please share the complete logs with us so we can check them and update you accordingly. This is the message I get when running the command from telnet, it looks like there is not such file.